The landmark storyline that launched the New 52 as you've never seen it before, stripped down to artist Andy Kubert's original pencils. 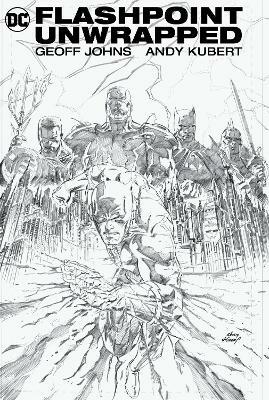 Written by industry legend Geoff Johns, this volume collects the full five-issue miniseries as well as behind-the-scenes sketches and commentary... read full description below. This unparalleled reintroduction of FLASHPOINT is presented for the first time in the orginal line art from superstar artist Andy Kubert.Not a dream, not an imaginary story, not an elseworld. This is Flash Fact- When Barry Allen wakes at his desk, he discovers the world has changed. Family is alive, loved ones are strangers, and close friends are different, gone or worse. It's a world on the brink of a cataclysmic war--but where are Earth's Greatest Heroes to stop it? It's a place where America's last hope is Cyborg, who intends to gather the forces of the Outsider, the Secret 7, S!H!A!Z!A!M!, Citizen Cold and other new and familiar-yet-altered faces! It's a world that could be running out of time, if the Flash can't find the villain who altered the timeline!Collects FLASHPOINT #1-5. Geoff Johns is an award-winning writer and one of the most popular contemporary comic book writers today. Johns is the author of The New York Times bestselling graphic novels AQUAMAN- THE TRENCH, BLACKEST NIGHT, GREEN LANTERN- THE SINESTRO CORPS WAR, JUSTICE LEAGUE- ORIGIN, SUPERMAN- BRAINIAC and BATMAN- EARTH ONE which hit #1 on the bestseller list. He is also known for transforming Green Lantern into one of the most critically and commercially successful franchises in comics. Johns was born in Detroit and studied media arts, screenwriting and film at Michigan State University. After moving to Los Angeles, he became an assistant to Richard Donner, director of Superman- The Movie. He and his mentor Donner later co-wrote SUPERMAN- LAST SON featuring the return of General Zod. Johns has written for various other media, including episodes of Smallville, Arrow and Adult Swim's Robot Chicken, for which he was nominated along with his co-writers for an Emmy. He is the Chief Creative Officer and President of DC Entertainment and resides in Los Angeles, California.